Gmuni: Free Buses for All! 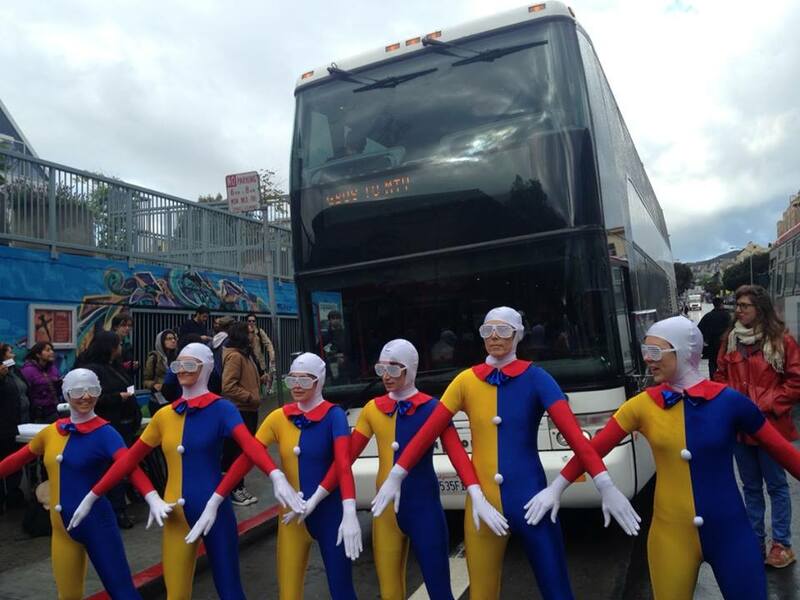 This April Fools Day, Artists, activists and community members came together to stage Gmuni: a free buses for all launch party. 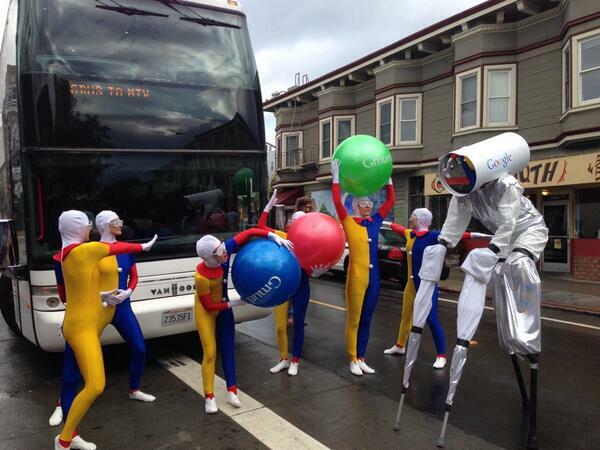 They're celebrating an imaginary Google service allowing the public to ride the private shuttles, "Google Buses," for free since MUNI is in crisis, and a fare hike is imminent. The event kicked off just hours before SF supervisors were to decide if wealthy corporations like Google can continue using public infrastructure for virtually no cost, while the public pays more than ever. Since 2007 private shuttles, a.k.a. “Google buses”, have been using our tax payer-funded public bus stops illegally thousands of times a day. SFMTA has made backroom hand-shake deals with these wealthy corporations to turn a blind eye, while ticketing the public $271 if they stop in a MUNI zone. This is just one example of the two-tier system that exists in SF, the city with the fastest growing inequality gap in the country. The second tech boom has also brought us: no fault evictions up 83%, rents up 20% where “Google buses” stop, and the displacement of elders, long-time residents, and families in favor of whiter, richer newcomers. At 3pm today at City Hall, Supervisors will decide if these corporations can continue to use public bus zones for a mere $1 per stop. Meanwhile, underfunded MUNI is considering a fare hike. Why fund MUNI on the backs of poor and working class people while rich corporations use public infrastructure for pennies? Join us in saying: HELL NO! To deflect mounting public pressure, Google agreed to give $6.8 million over two years to fund free MUNI passes for youth. While we welcome their money, in 2013 alone Google should have paid $10.6 million in parking fines. They also owe the federal government over $11.7 billion in unpaid taxes on income stashed in overseas tax havens. They owe their users countless billions for selling off theirprivate data for profit and making products that “innovate” the surveillance state. Google is not alone in exploiting common land, resources and data for private gain. They’re just one of the worst examples. With more revenue than half the state of California, a lower tax rate than most of us, and executives who make millions per minute, it is time to shift our priorities to value people over profit and public over private. Let's take back the city! improvements, and legislation to repeal the Ellis Act & Costa Hawkins! -A moratorium on all no-fault evictions. -Investment in all people, not just tech.